The first story I ever read by Seth Dickinson was published right here in Clarkesworld. With “Morrigan in the Sunglare,” I was introduced to an author concerned with complexities and subtleties, power, and hate. His stories dive deep under the emotional and societal surface to explore the more challenging parts of being human. 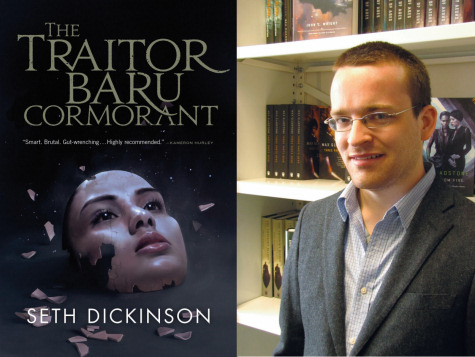 The Traitor Baru Cormorant, his debut fantasy novel, comes out from Tor Books September fifteenth and is a fascinating look at someone bringing down a tyrannical government from the inside. Through the eyes of Baru Cormorant, we see the conquest and cultural subjection of an entire society as it is assimilated into the larger empire of the Masquerade. Baru’s life, her family, her home, and her sexuality are all under attack and she must use her sharp mind to use the systems in place to save herself and her people. Seth is a graduate of University of Chicago, a lapsed PhD candidate at NYU, an alum and instructor at the Alpha Workshop for Young Writers, and used to write item descriptions for video games at Bungie studios. His work has been published in Clarkesworld, Shimmer, Lightspeed, Analog, Strange Horizons, and Beneath Ceaseless Skies. For a time, you studied social neuroscience as a doctoral student at NYU. Has that influenced your writing? Oh, man, right to the heart of things. Yeah! Behavioral science colors everything I write. My time in academia ripped up a lot of my assumptions about people and the world. We used brain imaging, eye-tracking, and a lot of behavioral measures to study how decisions can be swayed by invisible social forces. My project involved millisecond-level simulations of the role of racial bias in police shootings. We were trying to create a firearms training program that would lead officers to make fair choices. My colleagues worked on a huge range of experiments studying prejudice, power, and implicit attitudes. People don't understand their own behavior. Every day, we make choices driven by social cues and weird heuristics that we don't notice. That's okay. It doesn't take away our agency. But we do have a responsibility to look at our own behavioral outcomes and try to understand what drives them. Prejudice is real, powerful, and endemic. Certain mechanisms in our brain soak up subtle (and unsubtle) prejudice from the cultural bath. And it sways key decisions—hiring policy, shoot/don't shoot choices, even our facial microexpressions. But at the same time, many things we think of as biological facts are actually cultural constructs! That suggests we may be able to reprogram ourselves. Last (and greatest) is my love of really tough moral dilemmas. I grew up on the Milgram experiment, Hannah Arendt, the Robber's Cave, and the Asch paradigm—scary, cutting insight into human moral behavior. I want to know how people behave in extreme circumstances. I want to look at evil rationalized as good, good dressed up as evil, territories where ethical systems break down, the clash between utilitarian and deontological ethics, and—in the end—the human, emotional cost of making impossible choices. The Traitor Baru Cormorant is about a woman who will do anything to achieve her goal of world liberation, because she believes the goal is so good it justifies any sacrifice. And it's about how much that hurts. I also picked up a bunch of cognitive tricks to keep readers engaged, but I'm pretty sure writers already know them! “Morrigan in the Sunglare”appeared in the March 2014 issue of Clarkesworld. While a very different story, I think it has some similar themes to your novel. Have you found a common thread running through your work? I think it's this idea of the necessary, monstrous choice, the Sophie's Choice. Back as a teenager writing embarrassing fanfiction, my heroine had to blow up a space station to save the universe, which became the blood calculus in “Anna Saves Them All”; in “Worth of Crows” the necromancer chooses to mercy-kill the man; in “Never Dreaming (In Four Burns)” (here in Clarkesworld!) Nur Zaleha has to choose between death and losing what she believes in. In 'Morrigan', Laporte and Simms struggle with the psychology of combat, and they each find their own way to justify violence. But I'm not necessarily interested in worshipping or valorizing that choice. The Hard Choice often sees use as a justification for atrocity—torture, murder, breach of due process. I want to look at the cost of it. Sometimes it's important to stick to your principles. Sometimes that makes for a better, warmer world. And I want to look at the space after the choice. My favorite structure operates in two parts—the first part pushes the protagonist out, away, into lonely ruthless spaces, and the second part asks them to come back, mend their wounds, and accept a world of human compassion and solidarity, if they can. If you've put away trust, love, and the possibility of redemption, can you get them back? Will that jeopardize your victory? Maybe community and compassion are a better way to get what you want. That's the driving tension of the 'Morrigan' sequel, and the next Baru Cormorant novel. What made you choose to go from writing short fiction to a trilogy of novels? Has your writing and process changed with this longer project? I've always wanted to write a novel, and it was the right time. I wanted to tell a story about the forces that create oppression and conflict. I knew I'd need a novel to do it justice. My process changed a fair bit. I picked up Scrivener to help me organize research and scenes. I had to relax my prose a little, so I wouldn't drive myself mad polishing every sentence. I spent a while practicing a sentence-level tension cycle that I hoped I could use to make the book taut, paranoid, and gripping. I worry a lot more about my physical and mental health now. I could always produce short stories in a burst of creativity over a couple days. But now that I'm under contract, and I'm nervous about letting people down, I have to care for my resources and attention. It's tough! I haven't really figured it out yet. In The Traitor Baru Cormorant, you give us a peek at a very complex world in varying stages of social, political, and economic unrest. What were some of the challenges you faced creating this world and the systems within it? I think the biggest challenge was teaching that complexity! I wanted a world that felt as dynamic, unpredictable, and many-layered as ours—like tumbling through a storm of money and ideas. But I also wanted the reader to feel like Baru. She has a gift for understanding these big, complicated things. I decided that Baru would look at the balance of power around the Ashen Sea as a game. I hoped readers would follow along and develop a kind of joyful game-knowledge of the world. Each of Aurdwynn's Dukes has a political game, a natural resource, and a web of likes and dislikes. Baru learns how to play that game to win. And when the world refuses to obey her game-map, she makes mistakes. I also thought a lot about how to defeat any suggestion of biological destiny. I want the cultures and 'races' in Baru's world (I use scare quotes because these races are sociopolitical constructs, not descriptive maps of biological difference—Falcrest in particular is an expert at the tactical redefinition of races to aid its imperial goals) to be impossible to map directly to any real-world society or history. And I wanted the development of systems of oppression to occur via mechanisms specific to the history of this world. I don't think I completely succeeded, but that's where I aim! I want the cultures of Baru's world to feel like the product of their own climates, geographies, and histories. I think the fantasy secondary world is a great chance to say, hey, our world isn't an inevitable and correct end state! We could've gone some other way! Baru is a fascinatingly complicated and conflicted character that wears many masks. Instead of joining an outright rebellion, she chooses to fight the Masquerade from the inside by more subtle means. Why have her do this? Is it sometimes better to change something from within? History is full of sobering, awful situations where the powerful stepped on the powerless. We have a lot of stories about the exceptions: successful resistance, defiance against all odds. I wanted to write a novel about triumph in the worst case—a solitary woman targeted by intersecting racism, sexism, and homophobia, fighting a long war against a powerful and intelligent empire who've passed over crude force in favor of efficient, calculated psychological warfare. Few of us, reading this, are ever going to join an armed uprising. All of us are going to try to make a difference from the inside, by choosing how to live our lives in a world that makes us complicit in awful systems. I also thought it would make for a straight-up awesome story, full of secrets, gambits, devastation, and different shades of victory. At some point while writing, did any of the characters surprise you by taking on a life of their own? Some of them have so many secrets. Xate Yawa! She's hiding so much. I would love to see the story from her angle. She's desperately trying to manage everything towards a specific objective, and Baru jeopardizes her life work. I found Muire Lo a huge relief to write because he was able to express simple, direct caring in a way most of the other characters couldn't. Tain Hu's incredible strength, power, and confidence was a gift to me—I could always rely on her to cut through Baru's webs and say, look, here is what we have to do, I believe in you, let's get it done. Tain Hu puts her oaths and her beliefs above all other things, which is a great foil for Baru's philosophy of exigency. Many of the Dukes really came into their own during drafts. I think Duchess Erebog and Unuxekome both surprised me, particularly Unuxekome's romanticism and Erebog's level-headed pragmatism bouncing off Ihuake. But of all of them the ones I wish I could spend more time with are Nayauru, Autr, and Sahaule. I want to know how they work! And, of course, I love the characters who are clearly living in their own story that just briefly intersects Baru's. I'll leave those for the reader to discover! Your novel pulls from a variety of different areas: social engineering to Joseon Dynasty siege weaponry. Could you expand more on the other influences in your novel? Cognitive psychology. Jeremy Scahill's Dirty Wars. Fantasy's neglect of the Islamic Golden Age, the Indian Ocean trade system, and other dynamic, vital sections of history. Code Name Verity, indirectly—I hadn't read it yet but people kept talking to me about it. Partible paternity in Amazon Basin societies. Naval warfare between Japan and Korea. The ugly history of eugenic ideology. Admiral Keumalahayati. 1984. Online discussion about who was and wasn't allowed to be the protagonist of an epic fantasy novel, because some people would, it was said, be 'too oppressed to do anything.' Megan Whalen Turner's Queen of Attolia. C. J. Cherryh's Downbelow Station. Civilization IV, but not V. Sid Meier's Alpha Centauri. Everyone at the Alpha workshop who talked about making things hurt more. Yoon Ha Lee. Sundiata Keita. We Have Always Fought, by Kameron Hurley. Agh! I wish I could remember everything. Is there anything you can tell us about the next book in the trilogy? I think I can! If you read the letters at the end of the first book, you'll find a lot of clues. The naval battle off Treatymont triggers tension between Falcrest and Oriati Mbo, and a second Armada War looms—kind of a fantasy Cuban Missile Crisis. The tension draws in Baru's old friend Aminata, Baru's second cousin Lao, and a laman named Tau-indi Bosoka, who's one of the Oriati Federal Princes. Together they confront Falcrest's monstrous ideologies, the many colorful characters in Parliament and the Throne, and the threat of total civilizational collapse in a whirlwind of plague, war, beetles, and cancer. The first book was a very focused, emotionally rigorous story. I thought of it as a scalpel. I want the second book to have much more emotional range, to spend more time on day to day life, compassion, and friendship—even as we move from the testing grounds of Aurdwynn into the arena of Falcrest politics. Falcrest is a very different place, where the Masquerade enforces its ideology in subtle, hands-off ways. Baru can no longer count on being the smartest one in the room. And Baru has to learn to trust and love if she's going to survive and maybe (eventually) be happy. I think of the second book as a novel in conversation and argument with the first one. Do you have any other projects in the works for after the Baru Cormorant trilogy? Nothing formal. I have a space opera epic I'd like to write, Exordia—you can get a glimpse of it in my Shimmer story “Anna Saves Them All.” And I've been playing with a young adult novel, kind of Portal meets Marathon 2: Durandal, about a pair of sisters who build a gate out of our world and end up in command of a haunted starship. For now, my eyes are on Baru. We'll see where things go! Since you’re an instructor at the Alpha Workshop for Young Writers, do you have any advice for budding authors? Read! Read good authors, take apart their prose, read outside your favorite genres, read history, read discussion and criticism. The world is larger and stranger than you can imagine. Write to satisfy yourself, and to express what you believe. Don't pin your self-worth on your writing. Don't let yourself feel like a failure if you don't get published as soon as you want. There's a long time ahead of you, and no timer on success. Finally, which is more difficult to write: a trilogy of novels or video game item descriptions? Ha! Destiny was trickier to write for, because I couldn't micromanage every detail to make it all work.